George F. Walker’s satirical play “Love and Anger” has been a favourite of Canadian audiences for many years. 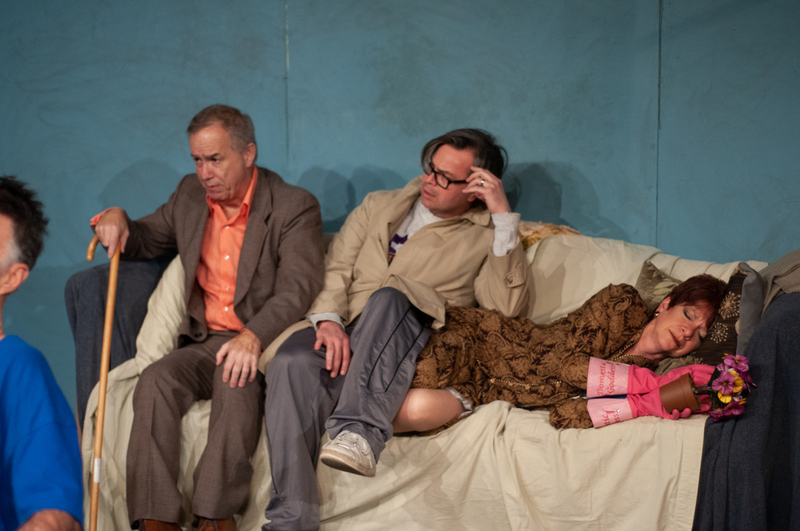 See it in the context of contemporary global angst and there is a freshness to Walker’s dark comedy, as this Durham Shoestring Performers production, directed by Carolyn Wilson, demonstrates. Not unlike our global political follies (both frightening and funny), Walker delves into a world of corruption, power, lust, greed and, of course, race. The fear is that this extremely broad canvas would allow only the most superficial depth of study for one evening’s entertainment, but Ms. Wilson’s direction and her latitude with the actors gives us tangible insight into Walker’s themes. Petie Maxwell, the newly inspired lawyer, dumps his pricey Bay Street clients for a new crusade from a ghastly basement office where he is determined to lift up the downtrodden. With his uninspired but loyal assistant Eleanor, they lock into combat with the evil owner of a local newspaper – “Babe” O’Conner. Complexity accelerates as “Babe’s” lawyer happens to be a former colleague of Maxwell’s and who also has run off with Maxwell’s former wife. It is a new client, Gail, whose husband has been incarcerated due to Babe’s manipulations. These careening relationships could get out of control, but Ms. Wilson manages to keep our focus for the most part. The set fully represents Maxwell’s decision to plunge into the depths of poverty and injustice. Like an old basement rec room complete with greasy handprints and lumpy furniture, the office parallels Maxwell’s chaotic new adventure. Ms. Wilson, also responsible as set designer, gives us the appearance of turmoil even as she adds specific details that establish the aging basement. Pointedly, we see an abandoned Knob Hill Farms box peeking out from above a window – not even one of those handy plastic bins, but a tired cardboard version looking a little pathetic. One of the set’s anchors, a boxy cherry-red heavy set desk, appears misplaced among the mismatched furniture. It has the potential to elevate the lawyer’s status, but instead it becomes a receptacle for outerwear, canes, pills and pizza. It ultimately becomes a symbol of the hollow efforts at justice as it becomes the centrepiece for the finale’s mock trial. Maxwell is finely played by veteran actor Ross Libbey. He meets the challenge of convincing us of his new outlook on life and justice as he demonizes the “system” with long philosophic rants in the first few pages of the script. His other challenge is the varying physical elements of his performance. He consistently establishes the outcomes of a recent stroke. Heart problems and breathing difficulties compel him to stagger up and down stairs and roll on the floor in spasms of pain. The character’s dreams may seem unfocused, but Mr. Libbey gives us a character for who we feel compassion. Margo Rodgers pins the audience to their seats from her opening entrance to the final scene. Playing Eleanor’s psychotic sister who has escaped from an institution, Ms. Rodgers is a standout as a convincing lunatic and who, as an actor, takes large risks with swinging modulated language and well-orchestrated physical bravura. Suggestive of a Shakespearean fool, Sarah tends to ironically bind the chaos around her as we question who really is the fool. Ms. Rodgers elevates this production with her tempered mania and is a tribute to the license awarded her by Ms. Wilson’s direction. Nancy Gleed is compelling as the hand-wringing secretary who tries to hold the entire business together. As mentioned earlier, it is her foil sister, Sarah, who has more success at this. Eleanor’s elegant and utilitarian outfits contrast, by design, with the garish orange shirt of Petie, and the wild bohemian layers worn by Sarah. The audience is delighted with Ms. Gleed’s well-hewn stagecraft as she subtlety minces around the stage softly whining and rolling her eyes. It is fun to watch her, horrified by the wildness, ultimately bend to her work as court reporter. Greg White plays the stylish, but ultimately nefarious lawyer with natural stage presence. His elegance belies the ruthlessness of the ever hovering worry of “the system.” Mr. White should be given credit, along with Tammy Everett, for a controlled and convincing fight scene that was exceptionally choreographed at the end of Act One. Laka Ford-Williams and Dave Drennan round out the cast – while rising to the occasion of confronting their enemies in the second act, they are often overshadowed by the strength of the four main actors. George F. Walker’s play sends us down a number of rabbit holes without escape – why Eleanor’s sudden interest in her sister’s drugs or why the strange inclusion of a gun? Some answers might come from the symbiosis of the relationships – neutrons and electrons – opposite but attracting. The themes of power and politics and ends justifying the means are played out through these strange relationships. This company has offered an entertaining evening of navigating these relationships and demonstrating that both love and anger often inspire these connections. Performances of ‘Love and Anger’ continue January 23, 24, 25 and 26, 2019 at 8:00 pm at Oshawa’s Arts Resource Centre 45 Queen Street (behind Oshawa City Hall). Tickets may be purchased at the door before each performance.